Guided, on wheels. A footboard panel conceals the drawer at the foot end. Not suitable for Platform and Custom beds. Fitted drawers must be ordered with the bed. Full length, fitted, guided and on wheels, they can placed on either or both sides of the bed. 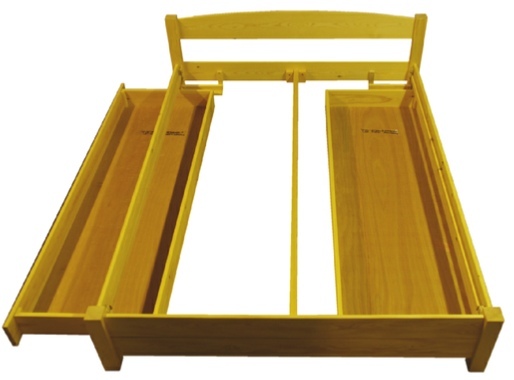 Two standard drawers fit under 5’0 and wider beds and can be adapted to fit under narrower beds if necessary. Plywood dust covers are optional. Platform beds can also take the free standing drawers above. The Manhattan and Daniella beds are lower, and the wheels are replaced by polypropylene glides (domes) to reduce the drawer height. Taller than the fitted drawers by 2" (5 cm). They sit directly on the floor on polypropylene glides and not on wheels. They can be ordered at any time and placed anywhere under the bed, including at the foot end. They are supplied with wooden knobs as standard. Suitable for all bed frames. Three quarter length with side panel at head end. Internal l dimensions: 70½"(179) x 23"(58) x 5"(13). All drawers are fully assembled and built to last. Made from solid wood with 6mm plywood bases.